Great Catholic Books for you: Bible, Missals, saints, story books for children. Roman Catholic books like the Baltimore Catechism, the Catholic Bible, the Liturgy, and the many stories about saints teach us to know, love, and serve God in this world so as to be happy with Him in Heaven. The Importance of choosing good books. Catholic Liturgy, Missals, and Prayer Books. Autobiographies and biographies of famous Catholics. The question is, "How do you know if a book is Catholic?" Your faith depends on it! You must be discerning. It's a matter of the Eighth Commandment. Some make the answers for confession plural. Yes, many questions can be answered in the possessive plural without changing the meaning much, but Confession is a singular matter. You may have heard more than one parish priest admonish his congregation not to confess the sins of others. You'll want to chose to use the versions of books that do not remove the truths about the Faith and that use definitions rather than subjective answers. This takes using discernment, getting recommendations, and doing your own research. Learning the Catholic Faith well often depends on choosing Catholic books carefully and the catechism is both the guide to good books and the measure of whether a book is Catholic or not. It is the most important book that you need to be doctrinally correct. Books are specifically Catholic if they were written by Catholics on Catholic doctrine, and both approved of and used by the Catholic Church. They're important because they teach the faith and help us keep the faith. Catholics can not study books of other religious persuasions on the subject of religion, and then hope to learn how to get to Heaven or to live a Catholic life on earth. It's plain common sense. In the beginning books were hand written so they were rare and costly. Now they're available in many formats: books, audio, and online. It's still best to have them in book form for edition/revision certitude. For centuries the main Catholic books were treasures that taught the faith. The main books that were widely available were the Catholic Bible, the Liturgy books, the Martyrology, and local catechisms until The Catechism of the Council of Trent was finished. They have conveyed the Catholic Faith to millions and are beacons for us all. They are encyclopedic in their information and unsurpassed for their inspiration. Most importantly, you can refer back to them to compare whether what you read in other books is good. Few books were named "Catholic" that were not truly Catholic. That or someone eventually condemned the book. Thank God for the many companies who have preserved older Catholic books because they've been an important part of keeping our lives "on track". The trouble is that fewer companies are keeping these books in stock and fewer are leaving the text unchanged. Other books that are written by Catholics and discuss Catholic topics are Catholic insofar as they agree with or teach the Catholic Faith. Catholics have written and continue to write bazillions of these. Yes, this all requires work on your part. Yet we all have the duty to be vigilant. Hopefully your priest can recommend good books. Often, your family and friends can share their favorites. Lepanto Press - Has a lovely Douay-Rheims Bible, Catholic homeschool books, and books by James Fitzhenry. TAN Books - Especially their older choices and most especially the Douay. Neumann Books - Now owned by TAN. Amazon and Ebay offer used books, but you'll have to know the names of the books or the authors to navigate safely. Archive.org keeps Catholic books online in digital format. The main Catholic book is the Bible. See more about Catholic Bible books and the books of the Catholic Bible here. When searching for Catholic prayer books you sometimes need to specify the term Roman Catholic since there are Anglican "Catholic" books, etc. Catholic Missals - The Roman Catholic Missal is a complete daily Catholic prayer book. It's the original "thought for the day" book. It covers the daily Mass and usually has the main Catholic prayers and many saints stories or notes from The Imitation of Christ. It uses the Bible for several readings each day of the year. Spirituality - Different religious orders have their own spiritual habits and advice: Benedictine, Dominican, etc. Catholic Liturgical Calendar The calendar reminds you when the feasts and holy days are. This isn't properly a book, yet it is a very handy reference. Once you know Catholic principles, mostly the Apostles Creed and the Ten Commandments, you can discern whether books are Catholic or not. The catechism is the fundamental of Roman Catholic books for determining which books are good and which are not. A good catechism book has all the basic answers. If a book contradicts the principles of the Catholic faith, it is not a book to read. Catechisms offer the Catholic principles necessary to learn to practice the Faith well enough to live the faith. You must know what is right so you can choose what is right. Our first recommendation is to learn the basic Catholic beliefs as taught in a catechism such as the Baltimore Catechism for children. (This can be an easy way for an adult to learn, too, like using Cliffs Notes). The Catechism of the Council of Trent and The Catechism Explained are excellent for high school and adult students. This is the Faith was recommended by the religious sister who taught two of our daughters and is published by TAN Books. This Is The Faith used to be available as a Catholic audio book on CD. Perhaps you can inquire at TAN Books whether they will offer it again. These catechisms are excellent for high school and college level study. The first and last are published by Tan Books and the other is produced by Instauratio Press, now known as St. Benedict's Book Club. Another real gem is Children's Retreats, by Rev. Fr. Halpin, Lepanto Press, Post Falls, ID. It has a section on the sacraments of Penance (Catholic Reconciliation), First Holy Communion and Confirmation followed in another part by stories to exemplify each of these three sacraments. It is seems to be meant for teachers or older students, and it teaches a great deal as it goes. It offers much that one can retell for a younger child as Father does in the book and it is one of my favorite supplemental Catholic books for sacrament preparation. Deharbe's Small Catechism from Christian Book Club of America is a most concise and helpful book, especially for older students who do not need the visual aid of pictures (RCIA, CCD, Catholic Religious Education). This is one of the very few catechisms where I've not had to use white-out. Even. Once. It parallels the Baltimore Catechism. The images in The Catechism In Pictures teach many doctrines better than any other catechism you'll find. 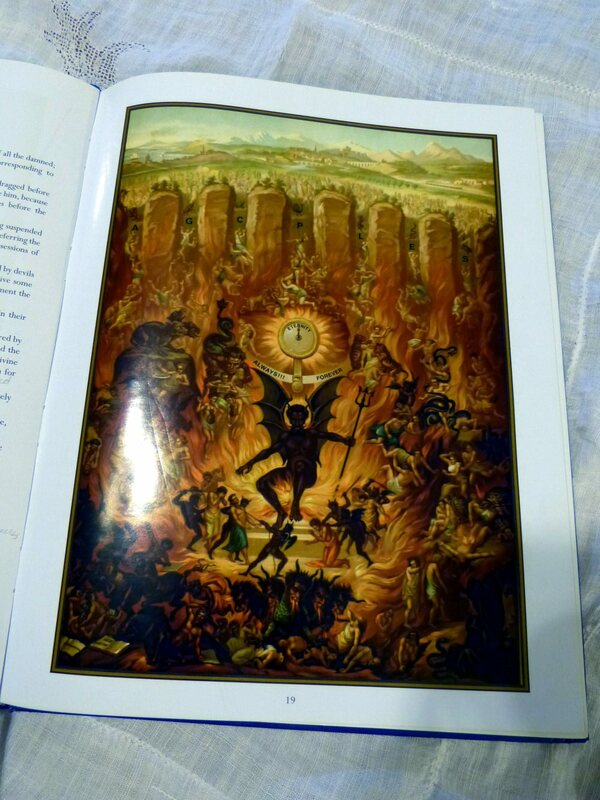 This book is full of beautiful artwork plates which are a catechism in themselves. Young and old will learn and marvel as they read and look at these beautiful pictures. You'll marvel at the details. 2010 UPDATE: An edited version was republished and is available at the Immaculata Book Store, El Camino Real, and the Angelus Press. (Blue with gold edges on glossy paper.) Be careful here as there are some unwelcome changes. I can no longer recommend it as heartily as the first one I own. A great companion book to the First Communion Catechism year is Jesus Comes, Book 2 from the Our Holy Faith series published by Neumann Press, Long Prairie, MN. This is the best Baltimore Catechism version for First Communion I've found in over twenty years of purposeful comparison. We were thrilled to find it. It also has the fewest omissions. The pictures are sweet and modest. It teaches about Adam, angels, Abraham, Moses, the Holy Family, the Catholic Ten Commandments and the Catholic sacraments. You can use the book as a photo album, flipping to the pictures about the ideas that you review. When we used it as a photo album, we would flip through the pictures asking who the pictures represented and what those people did. The modest pictures helped to expand the Bible stories which help the memorizing and drill make sense to your children. This is the book from which most St. Anne's Helper First Communion answers originate, complete with Nihil obstat and Imprimatur. Our digital downloads offer the best Catholic answers to the Baltimore Catechism questions. 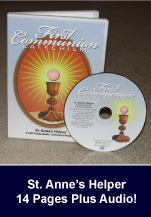 The St. Anne's Helper First Communion Audio CD (or Download) concurs with the Confirmation Audio Helper CD. This means there's no unlearning an answer later. The few questions (Ten Commandments, Blessed Trinity, definitions of the Catholic sacraments, etc.) that are the same in each catechism, have the exact same answers which spares confusion. See our Catechism Ideas page for the benefits and features of using these most helpful CDs to aid the memory work required by some pastors and CCD classes. The New Catholic Picture Bible can be a great photo album of salvation history for both children and adults (Cliff notes) who are studying the Eucharist. It is used in the Catholic home school curriculum at Our Lady of Victory School. Noe and some prophets are given the Protestant spellings of their names (which is a signal to beware), but we have otherwise used that book as a great visual memory aid (like a photo album) and as an early history book as well as a mini Roman Catholic Bible which seems to concur in meaning with the Douay-Rheims version. It can be a great help liturgically, too, because the Nativity story has such good pictures and stories for the Roman Catholic Advent season and the Christmas season, the Passion of Jesus for the Lenten season and so forth. This is also useful for teaching the mysteries of the Rosary. The Living My Religion series is used and now published at OLVS, too, and makes a great "reader" for the first few years of homeschool. 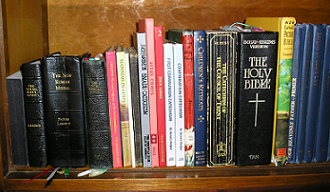 It was the first set of Catholic text books that we had used when we began homeschool. They are great grade appropriate readers. It's fun to see the nuances the children will gather from their own reading. It is also a great companion set for expanding your children's knowledge of the catechism toward the information necessary for Confirmation. OLVS has republished this set with a workbook for the first book. The following books are more for high school and college level reading; yet if you are teaching about Confirmation, you'll find that these have all the answers and explanations. The Catechism of the Council of Trent (CCT) offers high school and adult level study of these same principles and they are surprisingly easy to read and understand. The CCT was the foundation for the Baltimore Catechism and many Catholic catechisms since that time. The Catechism Explained (Amazon) expands the Baltimore Catechism for adults and has an excellent Index in the back compared to most books of that era. Further study and reference to sources at a higher level can be found in the book The Church Teaches (Amazon) since it has quotes from the Doctors of the Church. If you are beginning to study the Catholic Faith as an adult, be encouraged that you only need one good catechism. One good book is all that's necessary to learn the basic Catholic truths. See our Catholic answers page to see that most Baltimore Catechisms concur with very little difference in the wording of catechism questions and answers. The discrepancies are few, especially where there are no expansions; but you'll want to know where the differences are. The most concise and easy to use presentation of the basic Catholic beliefs for Confirmation are the St. Anne's Helper Confirmation downloads and E-Catechism Copybooks. Reading the lives of the saints helps your faith come to life. 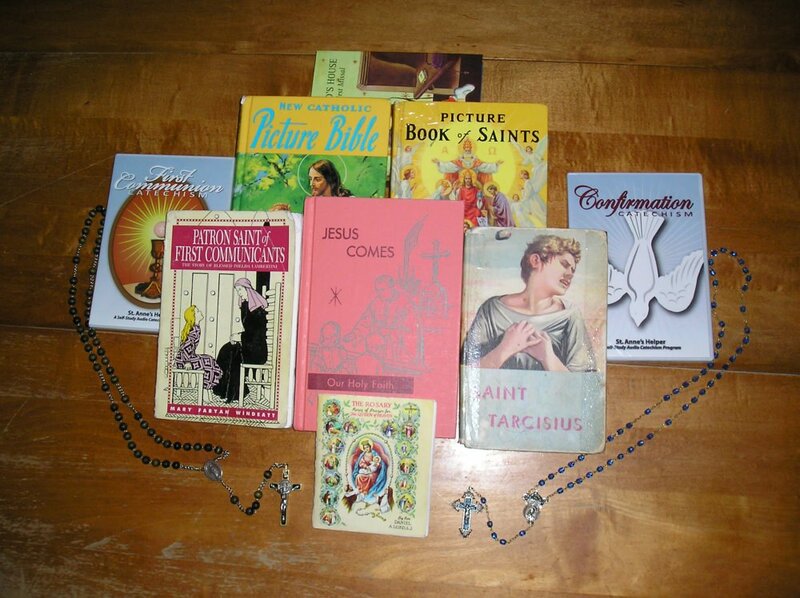 Catholic Saints - My favorite Catholic saint books. Be vigilant here, especially with new authors or reprints that change text. Many of these books could also be read during the school year, but these are also less "text booky", or more interesting in and of themselves, not merely books for information during the school year. All these books are edifying and many are also very interesting for adults, especially the high school reading list. You'll find these on some Catholic homeschool books reading lists, too. El Cid - God's Own Champion - Excellent history of early Spain's hero. Saint Fernando III of Castile - The best saints' story I've read. Biography of Gabriel Garcia Moreno - Heroic martyr President of Ecuador. You'll especially like that Mother of Our Savior's Refuge of Sinners Publishing republishes their books with no changes. TAN used to do the same, although it would also publish newer works. TAN Books company has been sold, so you may have to double check the new versions to see if any changes in the books are noted. I wish I'd had this list thirty years ago. Better, I wish my teachers had used these books when I was in school. There are also others who have worked to republish and restore good books like Our Lady of Victory homeschool and other Catholic homeschool companies. We are so fortunate that there are so many Roman Catholic home school programs available today. The new textbooks read better than textbooks did 30 and 40 years ago. Many homeschool books teach their subjects better, too. 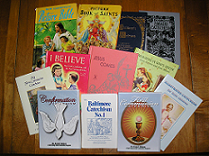 Many Catholic homeschool curriculum publishers have rewritten old Catholic books (Seton) that needed updating for Catholic homeschooling or have gone to great effort to republish authentically Catholic books. See my Catholic Homeschool recommendations here. Catholic Books for Children: Kids love the stories and the prayers. The Catholic Church has some antique children's books that are most endearing. Neumann Press had a very nice selection of republished old children's books and song books. This company was bought by the new TAN Books which has retained many Neumann titles. We like using this Catholic children's Bible and St. Anne's Helper Catholic Audio Books for First Communion and for Confirmation that teach the Catholic prayers for children. Be sure to add The Children of the Kingdom ebook and the Catholic Mother Goose Nursery Rhymes for fun. They are super to read to little children. Catholic audio books make it easy to learn the truths of the Catholic Faith and to hear the stories of the saints. Faith comes through hearing and, if you do not have good sermons available, you'll need to read them. Many audio books offer you the same benefits as reading or listening to a sermon. And when your high school children are reading books that are a bit difficult. The best Bible audio books we've listened to is the Audio Douay-Rheims Bible. Find Catholic Audio Catechisms here. Out of print Catholic books are super cheap or free at Amazon or even at Archive.org. They're taken from libraries and other sources so you can have the world's best Catholic library at your finger tips. It's often hard to search those sites for Catholic books unless you know the names of the books or the authors. Once you have these then you can search online. Children of the Kingdom Ebook - Alphabet of boy and girl saints. Legend of St. Patrick Ebook - Awesome history of St. Patrick. See our Catholic Reading List for more good reading suggestions. and beautiful Catholic coloring books. Catholic books for Communion and Confirmation and everything in between!